4-H Advocacy Club–Cruella Deville is Guilty, Guilty, Guilty! by Mary Cosmo, Esquire.In 4-H Advocacy Club, Community, Mary Cosmo, Student Life. 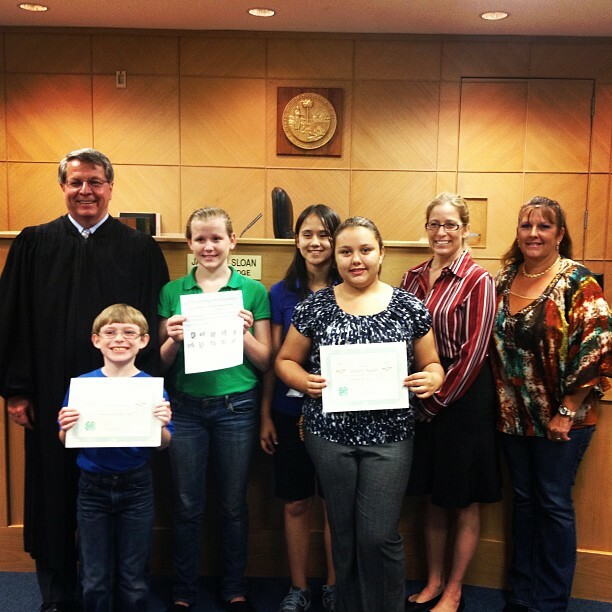 Picture from Left to right–Judge Sloan with Joseph Rourks as State Attorney; Samantha Bunting as Cruella Deville; Maggie Gacula as our Star Witness; Zeida C Rabelo as the Defense Counsel; Mary Cosmo 4-H Leader; and Mrs. Rabelo as the Jury Forman. The 4-H Advocacy Club’s visit to the Hendry County Courthouse was a huge success. The kids got a complete tour of the courtroom, the jury deliberation room, and even checked out the holding cells. The kids participated in State v Deville mock trial, which the infamous Cruella Deville was charged with 1 count of puppy napping. Joseph Rourks was an outstanding prosecutor, who hit a home run with his strong closing statement. Zeida Rabelo as Defense Counsel put on a great defense for the defendant, the infamous Cruella Deville (played by Samantha Bunting). In the end, the star witness (played by Maggie Gacula) testified with telling evidence, which resulted in a jury verdict of guilty. Cruella Devilla was convicted and sentenced to 30 months of jail and 30 months of probation. Mrs. Cruella Deville was then escorted out of the courtroom in handcuffs and shackles into the holding cell where she still awaits transport. A special thank you to Judge Sloan, Court Bailiff Mrs. Barbara, and Assistant State Attorney Hamid Hunter for assisting with the 4-H Advocacy Club’s first mock trial. YOU kids truly made the 4-H Advocacy Club a success! I am so proud of all of you! Thank you to all of your efforts. Next Next post: When the enforcement of Florida’s law goes bad—the people of Florida pay.